The Buddha’s teachings describe an accessible path to liberation. The ancient Buddhist metaphor of a path draws on the idea of a cleared passageway that allows one to move through an otherwise impassable forest. Just as a person brings his or her entire body along when walking on a path in the forest, so a spiritual practitioner enters the Buddha’s path by engaging all aspects of who he or she is. Yet while a physical path exists whether we walk on it or not, the Buddha’s path exists only in our engagement with it. We create the path with the activities of our minds, hearts, and bodies. Teachings about the Buddha’s path are simply maps indicating how we create the path as we go. In one version of this path metaphor, the Buddha likens spiritual liberation to a long-forgotten, overgrown city deep in the forest. Just as it’s possible to reclaim and then inhabit this city once the path to it is found, it’s possible to live a liberated life when we discover and follow a path that will take us there. Building on the metaphor of a forest path, the Buddha compared the forest’s dense undergrowth to the many mental and emotional obstacles that limit our freedom. We each have our own inner wilderness with its dangers and challenges, but we also have within us what it takes to free ourselves of these dangers. Because both the path and the obstacles are found within us, the Buddha’s path requires us to take responsibility for our thoughts, attitudes, and actions. It builds on the principle that we can move towards liberation by disengaging from perspectives and behaviors that weigh us down and by replacing them with behaviors that lighten us and support us as we proceed. The Buddha’s path to liberation—known as the Noble Eightfold Path—is made up of eight interrelated practices. The Buddhist name for each of these practices is prefaced by samma, a Pali word usually translated as “right” that can also mean “proper,” “complete,” and “in harmony.” When “right” is the translation, it’s useful to think of it as meaning “appropriate,” as when we speak of having the “right tool” for a particular task. Because the path is made up of practices rather than beliefs, “right” does not refer to truths we’re obligated to adopt or to moralistic judgments of right and wrong. 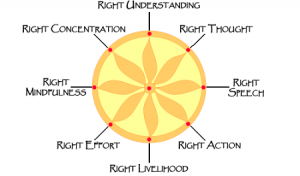 The first step on the Eightfold Path is Right View, a pragmatic perspective that guides us along the path itself. We can again make an analogy with hiking. Hikers in the woods practice “orienteering”—paying careful attention to details of their surroundings in order to find their way in the wilderness. They must first have some idea where they’re going so they don’t wander aimlessly and end up getting lost. But even when the compass points us to the destination, taking the most direct course may not be possible if it entails plunging over the steepest cliffs or into the densest, most overgrown parts of the forest. By knowing what to pay attention to, a hiker can “read” the forest and discover aspects that show the best way forward. For the Buddha’s path, this orienting perspective—called Right View—is the practice of keeping an eye on our relationship to whatever we’re experiencing. Classically this is described as using the perspective of the Four Noble Truths. Rather then getting caught up in our opinions and abstract interpretations of what we are experiencing, in this approach we ask ourselves a series of questions: Do we feel any stress, discomfort, or suffering in how we’re relating to what’s happening or not happening? What is our contribution to this suffering? What are we clinging to that is contributing to the suffering? Right View includes the encouraging perspective that clinging and its resulting suffering can be brought to an end. It also orients us to the practices of the entire Eightfold Path as the easiest and clearest path to liberation from suffering. Right View is not meant to be the only perspective from which to view our life. Other perspectives can be necessary for other purposes. However, in order to walk the Buddha’s path to freedom, Right View is an essential ingredient. It is the perspective needed to find the path and to stay on the path. Practicing Right View does not require believing something we can’t know for ourselves. It does not rely on any supernatural or mystical beliefs. Nor does it require us to be ahead of where we are. Pursuing a path involves walking where we are on the path; we can’t walk on what lies ahead until we reach it. The remaining practices of the Eightfold Path are Right Intention, Right Speech, Right Action, Right Livelihood, Right Effort, Right Mindfulness, and Right Concentration. These seven have a mutually supportive relationship with Right View. On the one hand, Right View helps us distinguish between the intentions, speech, ethical actions, livelihoods, and mental states that cause suffering and the ones that alleviate it. On the other hand, as we practice the other factors of the Eightfold Path, Right View becomes easier and more effective to practice. The more we clear the path, the easier it is to find our way. The potential for practicing the Eightfold Path lies within us. When we practice the factors well, they transform us. They have the ability to reduce and even end our clinging, attachment, fear, hatred, and delusion. When we do this thoroughly, the Eightfold Path is no longer something we have to walk. When we are free, there is nowhere we have to go to find freedom. When we live from our freedom, the eight factors are no longer practices; amazingly, they become the natural expression of liberation. The Eightfold Path becomes who we are.